Let us know any comments, reviews corrections, and/or suggestions. Recipe contributions and pictures of dishes you have prepared are always welcome. 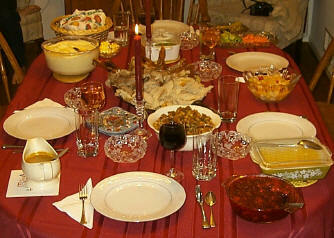 Our family enjoys great times together and food is certainly a part of many of our celebrations. This on-line cookbook has been put together to make sure that all of our family has access from wherever in the world life may take them and to make sure that we can pass down traditions as the family expands. When there is a history or known source of a recipe we have made sure to add this information Like any good collection of family recipes whether on cards or written in the margins of tattered and splattered cookbooks, this collection will constantly grow and never really be finished. In some cases the recipes have been handed down through the family. In others they were shared between family and friends. We do not always know the original source but regardless the origin, these recipes have become favorites. Many of these recipes do not have specific directions or measurements as the cooks of yesteryear could not imagine someone not simply knowing how to make things as that skill was usually passed down in the kitchen with cooks and cooks to be working side by side. I have added directions for many of these old recipes. Send mail to Collected Favorites with questions or comments about this web site.